Oh So Cynthia is about showcasing the city of Dallas and what makes it a fabulous place to live. Although I love the luxe life, I'm a girl with champagne tastes on a soda-pop budget, so I am all about smart shopping. Throughout the holiday season, I will be bringing you a series of posts that will combine both of these concepts called Shop Local/Shop Smart, bringing you great gift ideas for under $200 from local designers and retailers. DJ Lucy Wrubel knows music like no one else does. 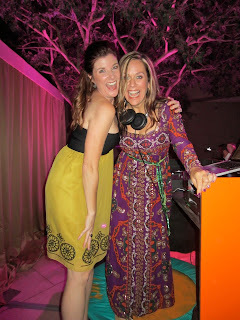 When I walk into an event and see Lucy at the turntable, I know its going to be a good night! Earlier this year, Lucy launched her Mix of the Month music club to share her unique tastes and rockin' grooves with us all. The cost is $144 for the year (one time payment up front). Lucy's website proclaims, "Even more intoxicating that a wine of the month club, Mix of the Month delivers 80-minute doses of great music to your inbox all year. And not just any music. Selections of tunes hand-picked and artfully assembled by DJ Lucy alone. Mix of the Month puts Lucy's special spin on the nostalgic mix tape." Every month you will receive collectible, download-n-print cover art, themed party playlists to serve up and play at any event and special edition mailings in your inbox with everything from custom art, and bonus playlists, liner notes and hits from Lucy on the road.